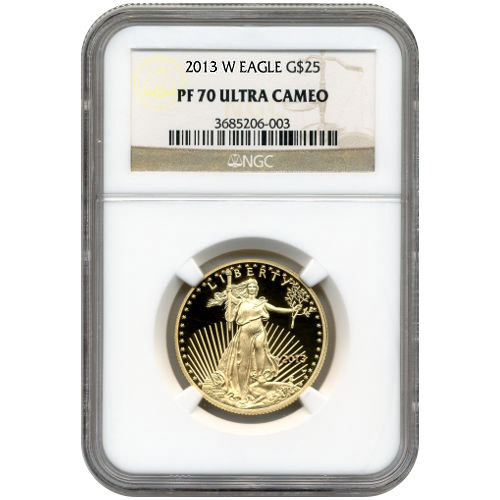 The Gold American Eagle coin program is one of the finest in the world and constantly in demand from both investors and collectors. These coins are struck by the United States Mint with a guaranteed weight and gold content of 22-karat gold. 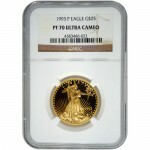 Each year the coins are produced based upon demand from collectors, and the Proof Gold American Eagle is in constant demand. 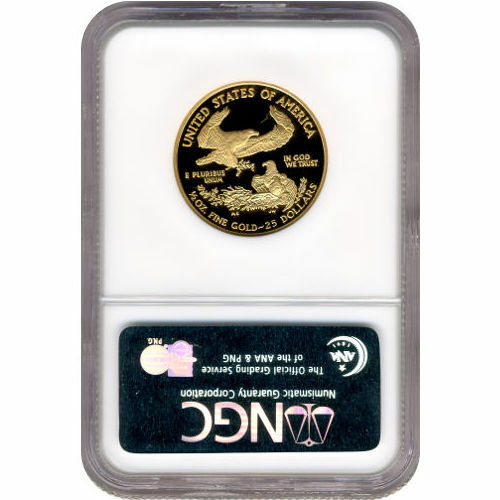 Right now, the 2013-W 1/2 oz Proof Gold American Eagle is available from Silver.com. Shipped in protective plastic slabs courtesy of the NGC. Earned a grade of PF70 by the Numismatic Guaranty Corporation. The United States Mint first released Proof Gold American Eagle coins in 1986 with just one weight available, the 1 oz weight. While the bullion version of the coin was unveiled the same year with four weights, it was two years before fractional-weights were available in proof. In 1987, the 1/2 oz fractional-weight coin was introduced into the series. One year later in 1988, the Mint unveiled the 1/4 oz and 1/10 oz coins in the series. The 1/2 oz coin has long maintained steady demand from numismatists. 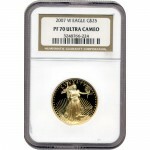 Each of the Proof Gold American Eagles in this product listing is in perfect condition. A PF70 coin features its full, original luster and no detracting flaws of any kind. Ultra-cameo is a term used to define a coin with a design field that appears to float above the background of the coin. On the obverse of all Gold American Eagles is the image of Lady Liberty created by Augustus Saint-Gaudens. This image first appeared on the $20 Gold Double Eagle in 1907, and is considered by many to be the finest to ever appear on a US gold coin. The reverse bears Miley Busiek’s family of bald eagles. Designed by the sculptor in 1986, the image appears only on the Gold American Eagle coin. If you have questions, we encourage you to reach out to Silver.com. Our associates are available on the phone at 888-989-7223, online through our live web chat service, and via email. If you are looking for similar products, be sure to visit our Gold Austrian Philharmonics page.